This smokers station is a permanent solution as it will last and look good for years. 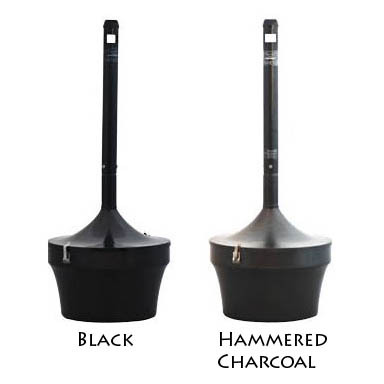 Includes a 4.5 gallon galvanized steel liner with handle for easy disposal. Attractive weather-resistant, fire-safe steel construction and oxygen-restricting fluted design extinguishes cigarettes. Will not melt--a good alternative to plastic models. Removable top fastens from the base by two easily operated clasps for emptying and re-attachment.